Last week, iglide on tour took to Music, City, USA – Nashville, Tennessee – let’s go back and see what happened! After leaving Cleveland, Ohio, the car drove over 500 miles to Nashville, the capital of Tennessee. A large center for music, publishing, healthcare, and transportation industries, Nashville is also home to a large number of colleges and universities. The city’s name came from Francis Nash, a general during the American Revolutionary War. The iglide car was able to make its way to the Grand Ole Opry – known as the home of American country music, and though the car couldn’t quite fit through the doors, the bearing-filled dry-tech box took its spot inside. The Grand Ole Opry began as a weekly radio broadcast in 1925, and is still among the longest-running radio shows in history. Live concerts by country music’s biggest stars are performed each week on what has been dubbed “The Show that Made Country Music Famous,” attracting millions of visitors every year. On a tour through the Opry, the dry-tech box was able to get a backstage peek at the venue, including onto the stage itself, where a circle of older looking wood surrounds the main microphone. This circle of oak is in fact part of the original Opry center stage, which was recovered after the venue flooded in 2010. This circle, where many of the most famous names in country music have stood, was built into the replacement stage to continue the tradition. A number of igus’ Motion Plastics solutions are found backstage in many venues around the world to help move stage equipment, sets, lighting, and more reliably and quietly. The liftband energy supply system can vertically expand more than 42 feet, lifting at more than 3.2 feet per second. The E-Z Triflex Energy Chain included in the system allows cables and hoses to be installed and exchanged very quickly and easily, and nylon tapes allow for a nearly unlimited filling weight, allowing even the most complex stage equipment or set pieces to be moved as needed for the best possible performance, night after night, and in the Grand Old Opry’s case, decade after decade! 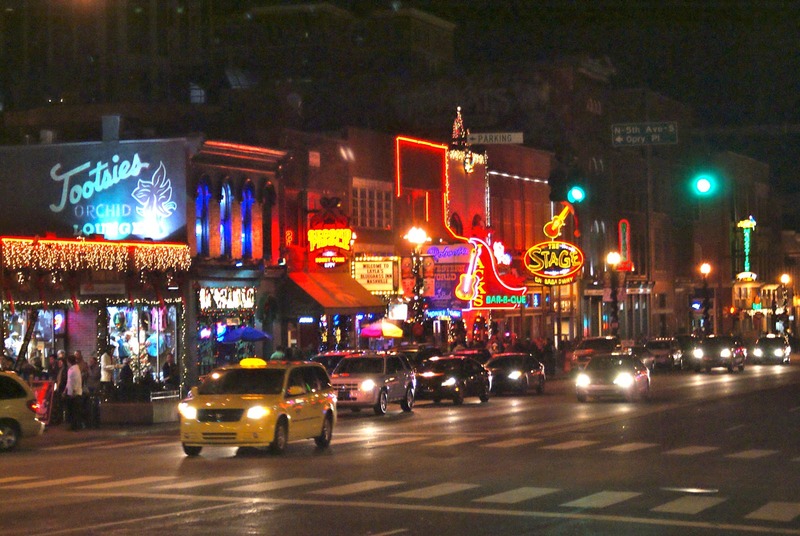 After leaving the Opry, iglide on tour headed downtown to check out Nashville’s Broadway, a renowned entertainment district and gathering place for country music lovers of all kinds. The street is lined with small bars and music venues, as well as dozens of cowboy boot Shops. Many of the bars lining Broadway have a real “honky tonk” feel – that is, they cater to the die-hard country music fans that live and visit Nashville with live performances nearly every night of the year. One of these venues was the portable Nashville Pedal Tavern, which seats 16 patrons – who pedal the bar around the streets of Nashville while enjoying their drink of choice! When the iglide car pulled up beside this pedal-powered pub, one woman was so excited to see the orange car she started a dance party for it, only stopping to pedal away once the traffic light turned green. During its time in Nashville, the car attracted much more than just dancing drinkers, however. Around each corner people would ask about the car’s story, and where it was traveling over the course of it’s journey, which had brought it nearly 37,000 miles to Tennessee! From Nashville, the car carried on in the American South – stay tuned to read about the next adventure of iglide on tour!